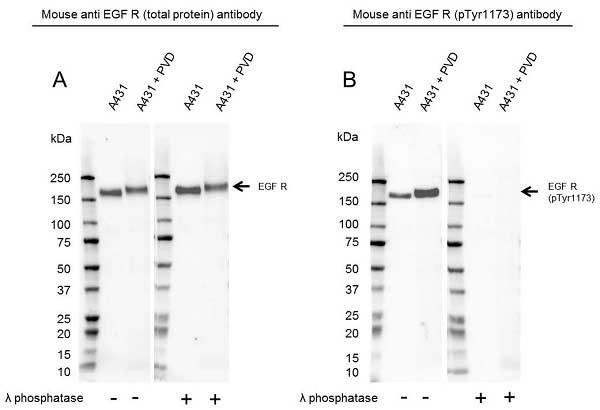 Western Blot analysis of A431 untreated and pervanadate (PVD) treated whole cell lysates probed with (A) Mouse anti EGF R antibody (VMA00061) or (B) Mouse anti EGF R (pTyr1173) antibody followed by detection with HRP conjugated Goat anti Mouse IgG (1/10,000, STAR207P). Membranes were treated with (+) and without (-) lambda protein phosphatase and visualized on the ChemiDoc MP with a (A) 2 second or a (B) 11 second exposure. EGF R (pTyr1173) has a molecular weight of 175 kDa. 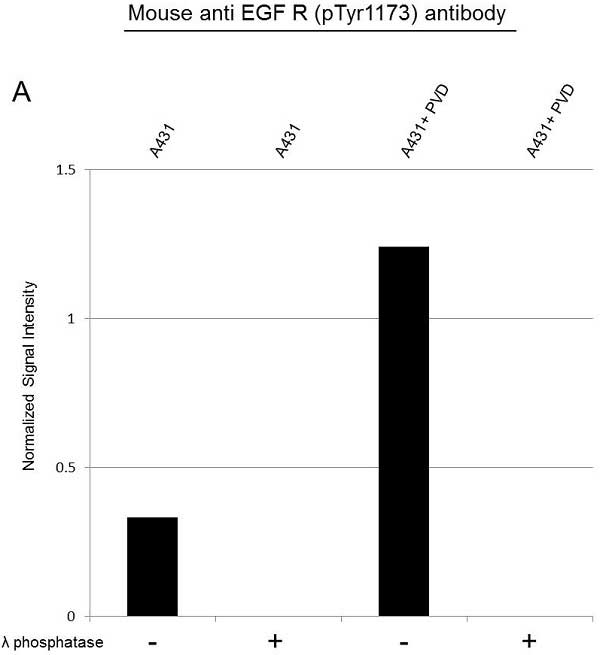 Normalized signal intensity of EGF R (pTyr1173) from PVD treated and untreated lysates, treated with (+) or without (-) lambda protein phosphatase. Lambda protein phosphatase dephosphorylates serine, threonine and tyrosine residues. Normalized signal intensity was calculated by dividing the TPN-Normalized signal intensity for each phosphoprotein by the TPN-normalized intensity of the corresponding total protein. Learn more about TPN Total Protein Normalization). EGF receptor (pTyr1173) antibody recognizes the epidermal growth factor receptor, also known as proto-oncogene c-ErbB-1 phosphorylated at Tyr1173. Mouse anti EGF receptor antibody recognizes the epidermal growth factor receptor, also known as proto-oncogene c-ErbB-1 or receptor tyrosine-protein kinase erbB-1, when phosphorylated at threonine 1173. EGF R plays a role in numerous cellular processes such as cell proliferation and apoptosis through the activation of downstream signaling pathways (Scaltriti and Baselga 2006). EGF R is autophosphorylated at tyrosine 1173 upon ligand binding (Downward et al. 1985). PRMT5- mediated EGF R arginine 1175 methylation modulates EGF R autophoshorylation on tyrosine 1173 (Hsu et al. 2011). EGF R phosphorylation on tyrosine 1173 correlates with a poor prognosis in oral squamous cell carcinomas (OSCC) (Monteiro et al. 2014).